Many people don’t appreciate how much they need electricity until they have to live without it for a couple of hours. Imagine not being able to recharge your smartphone or laptop, and not being able to flick a switch to turn on the lights after the sun sets. Fortunately, power outages in the USA in most areas are not very common. This is because power companies have invested a lot of money in their infrastructure. That said, environmental factors are unpredictable and there’s always the chance that a bad storm could result in a loss of electricity to many residential dwellings. In order to ensure your household is not badly inconvenienced during power outages, you might want to invest in a portable generator. Such units can ensure you have access to electricity when the main supply to your home is offline. You can plug all sorts of devices and appliances into these units and they are easy to transport between rooms. You need to make sure you take note of the wattage rating on each unit, however, as there is a limit as to want you can hook up to the basic models. If you live in an area of the country where power outages are a common occurrence, investing in a portable generator will add great improvements to your life. Without one in your home, you are probably finding yourself feeling really jealous of other homes in your neighbor that are able to turn on their lights and watch their TVs when the power is down. You don’t have to spend very much money in order to get your hands on a basic unit. Many units are also scalable with extra battery cells. You don’t have to buy a top of the range model straight away. There are many different types of portable generators in the marketplace and it’s important to take time to research your options carefully. Prices can range from around one hundred bucks to several thousand dollars. Therefore, you need to understand exactly what extra features you are paying for with the more expensive models. Fortunately, there are lots of great detailed buyers’ guides available for free online. These guides detail the specifications of all the most popular units and list all their pros and cons. So, make sure you check out a couple of those guides before you invest in your first or next portable generator. A home improvement business is an ideal home-based business for anyone who wants to make money putting their carpentry and construction skills to work. Such a business will give you the ability to make money regardless of the overall economy. No matter whether the housing industry is hot or cold, people in the home improvement industry make good money. During upturns, homeowners will renovate their homes rather than purchasing a new home at a higher price. Likewise, during downturns, homeowners will renovate their homes to bring up the value of their properties. A remodeling contractor makes money regardless of the economy in the country or locality. In fact, you don’t need to be an extremely skilled professional to start a home improvement business. You can always hire subcontractors to do the work for you if you have some knowledge in the construction industry. This article provides a comprehensive overview of starting a home improvement business which is one of the best in all types of economies. If you don’t want to start a business from scratch you can check out existing businesses for sale online. One such website with many business for sale is this one. The majority of homeowners make improvements to their homes immediately, during the first or second year of ownership. Hence, you should not delay getting into the home remodeling market if you have experience in the building industry. There are many reasons for this. First, the remodeling industry is predominantly populated by self-employed individuals just like you. The capital needed to start such a business is much less compared to a new construction project. The latest report released by the U.S. Census Bureau states that more than 90% of homeowners are not do-it-yourself-ers when it comes to home remodeling projects. They prefer to hire a professional renovating company to do the job instead of trying to do it on their own. Remodeling contractors can specialise any way they wish to. You can specialise in remodeling commercial establishments or residences. There are also other niches within the commercial remodeling industry such as making tenant improvement in buildings that are occupied by renters, rehabilitation of historic structures, and adapting buildings from one type of use to another. Residential re-modelers also can specialise in different niches such as restoring homes that are damaged by fires, renovating historic homes, renovating apartments and condos, and remodeling homes with specific architectural styles. There are many remodeling contractors who are bathroom improvement specialists, kitchens, sun-rooms, mother-in-law suites, greenhouses, and many other structures. Green remodeling is a very popular branch of home remodeling these days. They use non-toxic building materials while making spaces in the homes more energy-efficient. Also, these companies use recyclable building materials for all their projects. Being successful in a home improvement business requires you have hands-on experience in the industry. Whether you plan to do the work yourself or hire subcontractors, you need to have a good knowledge of the subject matter. You need to have adequate experience in ordering the materials, scheduling the work and supervising your employees or subcontractors. The work done should meet the building codes of the area and satisfy the clients. Most states in the United States license their building contractors. You need to have the proper license and insurance coverage to perform this type of service. These are very important factors to consider when starting a home improvement business in your area. National Association of the Remodeling Industry is the primary trade organisation in the home improvement industry. The organisation offers four types of certification for anyone interested in starting their own house remodelling business. Satisfied clients are the key to the success of your business. Repeat businesses and referrals from past customers are what keep the business coming in where home improvement businesses are concerned. Develop contacts with building material manufacturers, retail suppliers, distributors, and lumberyards to find the first customer for your business. Other services such as home insurance companies, architects, and home inspectors are also a great way to get your first customer. Listing your business in The Blue Book of Building and Construction is another way to popularise your business. A professional website is essential for a new home improvement business. It is the best way to build brand awareness and popularise your home remodelling business. Promoting the website on your social media profiles will help attract more consumers to the business. The internet is the cheapest way to market your business these days. There are so many free classified ads websites where you can list your business. There are also other websites such as Yellow Pages, Yelp, Angie’s List and Google Places for this purpose. There are some legal procedures that you need to follow to register your home improvement business (this will apply in most countries – if in doubt, check out your local obligations. You can go online and hire a legal document production service like the U.S. Legal Forms or Law Smart to create your articles of incorporation. You also need to register the business and obtain an Employer Identification Number (known as an Australian Business Number ABN in Australia) for your home improvement business. You need to contact the secretary of state’s office to obtain an application form to register a name for your business. Complete this form and return it to the secretary of state’s office. Go to the IRS’ website to complete the form and obtain an EIN or Employer Identification Number. Licensing laws would differ from state to state and country to country. You can obtain a general contractor’s license or a residential remodelling license. The state’s department of business will offer information about the licensing procedure in your state. You can visit their website on the net for this purpose. There is a small fee involved in this process. Insurance is another important factor to consider when starting a home improvement business. Contact a licensed insurance broker in your area for this purpose. Ask them what they can offer for your home renovation business. You may need liability insurance as well as be bonded to do business in the renovation industry. Make sure your contract experienced and licensed subcontractors if you plan to hire their services. It will help you succeed in your home improvement business in the long run. Central air conditioning can be pricey and consumes a lot of electricity. If you are still starting to live by yourself in a small apartment, you might want to find ways to spend less money on your expenses so you can save up for your future. But it is hard to live without air conditioning especially on summer seasons. The sweltering heat is not only uncomfortable but can also be bad for your health. However, do you know that there are alternatives for a traditional central air conditioning that you can use so you won’t consume too much electricity or spend a lot of money on the installation? Here are several air conditioning options for your home that do not have to be expensive at all! Do you want an air conditioner that is energy efficient and doesn’t take up too much space? Window air conditioners are small and are installed on your wall or window. The back of the unit is sticking outside because that part is where it will vent. This type of air conditioner cools a part of your home and helps you save money with low energy bills. The only disadvantage of this air conditioning option is that it won’t allow you to enjoy the view from your window and it will block natural light from coming in. When shopping for a window air conditioner, look for a unit that suits the size of your window. The cost this air conditioner ranges from $200 to $1,000 depending on the cooling capabilities of the unit as well as the size, shape, and brand. People who live in small apartments or houses will find window air conditioners efficient but if you want something that is portable, then this unit is not the one for you. A portable air conditioner will be helpful for those who want to save money by cooling only one part of the house at a time. If you have a centralized air conditioning system, the whole house is cooled even if you are using only one part of the house. Portable A/Cs come with special adapter kits that allow the units to vent the heat outside of the window or through the fireplace. But even if you already have an HVAC system, this type of A/C is still very useful. The disadvantage when using portable air conditioners is that they are usually pricier compared to window air conditioners and will use more energy. But if you don’t mind spending a little more money for the portability, then it will be worth it. The prices of portable A/Cs can be as low as $300 or as expensive as $1,500. But then again, the price of the unit will depend on the features, the energy efficiency, size, shape, and of course the brand that you want to buy. Ductless air conditioners or mini-split air conditioners are great alternatives if you want a quieter air conditioning system at home. They are quieter than a central air conditioner since the evaporator is connected to a small condenser that will be placed outside of your home. This unit might be more expensive than other alternatives but are more energy efficient than an HVAC system. The evaporator is placed high on your wall and might come with a remote control so you can achieve the temperature that you want for your room. The price of this kind of A/C ranges from $1,500 to $5,000. For more information about installing home ducted air conditioning, Acclaim Air Conditioning Pty Ltd | Gold Coast Air Con Experts are available for a free consult. Air conditioning is very important especially when the summer season comes. But you don’t have to spend a lot of money to get the comfort that you want. These air conditioning options are great for when you are trying to save money on expensive energy bills. Contact an expert to know more about them and to know which one suits your home. Outdoor blinds have been gaining lots of popularity over the recent past. One of the reasons for this is because many people want to bring/create an ‘indoors’ outside particularly deep into summer when temperatures are at the highest. In addition to this, outdoor blinds play a major role in boosting curb appeal while allowing just enough sunlight into the house. Check with your local outdoor blind stores for alfresco blinds that can be installed in patios, over large windows, verandah, or even the door. Most homeowners in Australia also love the added privacy and security that these screens do provide. Outdoor blinds provide one of the easiest and best ways to maximize the limited space in your home. You could have the blinds installed to cover the patio and verandah areas, thus more usable space. Australia is the only place on the planet where one day can experience all 4 seasons. Such can have devastating effects on windows, doors, and especially the frames due to the sharp temperature contrasts. Investing in high-quality outdoor blinds can, however, help protect your house from the wind, harmful sun rays, and rain too. One of the main ideas and advantages of investing in good quality blinds is to protect items inside from harmful sun rays that accelerate aging. Australia is also known for mosquitoes, bugs and some of the most dangerous crawling insects in the world. If installed correctly, outdoor blinds can help keep mosquitoes and most of these insects at bay. Your home could record a 50% decrease in energy bills with the blinds down. This is because the blinds help create a warm/cold air envelope inside your house, which means you do not have to run your air conditioning as much. This is particularly useful when temperatures are on the highest. The beauty in investing in outdoor blinds is that you can choose from a wide range of hues ranging from completely opaque to translucent ones. You can, therefore, choose various types of blinds based on whatever theme you have around your home. You could also use this for improved curb appeal. Depending on your preferences, you can pick blinds that apply best for the desired application. These blinds not only improve curb appeal but also increase privacy in your home. Your neighbors or passersby will not be able to see inside the house even with the windows open. In addition to protecting your home from harsh weather elements, bugs, practicality, and space, outdoor blinds do help improve your home’s curb appeal. Having these blinds installed transforms the face of your home totally, making it have a more elegant and unique look. The improved curb appeal and functionality adds something more, home value. Homes with these blinds and patios installed have a significantly higher value as compared to those without. This is one reason to have the blinds installed in your homes, particularly if you are into the property business. The 6 facts and advantages outlined above are clear indicators of how important outdoor blinds are for Australian homes. Whether you have been struggling with high heating and cooling bills, mosquito infestation, or just need to improve your home’s curb appeal and comfort, then these blinds have you covered. Be sure to buy these blinds from a certified supplier, and ensure they are of the highest quality possible. Some window-shopping and research on the vendor may come in handy especially when shopping for a trustworthy one. Some Australians are even taking style “on the road” and turning their boring old caravan annexes into works of art. Hit the road in style with a custom printed annex from the Aussie Outdoor company. A roofer like Gold Coast Roofing Company is a professional who is specialized in roof construction. Roofers usually monitor the entire process of roofing in commercial as well as residential construction. They analyze the plans of construction and makes sure that the roofing is done in strict accordance with the design. These professionals also determine the materials, substrates of beams, rafters, trusses. Roofers work on new installations as well as Gold Coast roof repair projects and renovations. As it is expected from their job title, roofers usually are required to climb onto rooftops to work. Therefore they should not be afraid of heights and should have good balance and also reasonable carpentry skills. If needed roofers also need to replace old materials with a new one to a solid structure. Roofers deal in different materials like rubber, polymer, metal, tile, and asbestos. Also, these materials have widespread applications in both industrial and domestic sectors. Rubber roofs are often preferred by most builders for their commercial buildings. Rubber roof installation is a very complex process and it cannot be managed without the assistance of experienced roofers. This is because it is the responsibility of roofers to uniformly mop the entire flat area of the roof using a coat of war melted tar. Installing these rubber sheeting requires measuring and cutting around every protrusion such as heating units, skylights, and vent pipes. Occasionally, a Gold Coast roofer is required to replace wood on the roof due to rot. This is commonly particle board sheeting that is secured to rafters by nails. Once the base wood is secured and safe, roofers will cover it with tar paper and shingles, steel panels of the metal roof. In securing roofing materials to the roof, power nailers in form of electric nailing guns are used. Often, roofers have to replace the wood on the roof due to weather exposure damage or even the cheaper quality roofs need to be replaced from time to time.But some roofing companies prefer to use nail and hammer roofing rather than power nailing device additional control that hammer offers installer. Some roofers choose to specialize in waterproofing concrete and masonry floors, walls, and foundations. They chisel and hammer away uneven spots in order to prepare the surface for waterproofing, then they apply liquid coating waterproofing compound. They also may spray the surface with a waterproofing material to the surface roofers, usually paint coating of bitumen on the exterior or interior surfaces when damp proofing. The most important tasks of roofers are job estimating. Roofers need to meet with clients and provide an estimate on the anticipated expenses involved in new roof installation. The roofers ability to formulate an accurate and realistic estimate is very important for both parties, because the estimation is too high, the roofing company can easily lose the contract to a competitor that quotes lower bid, on the other hand, if the quotation is lower, the company may not be able to make a profit. This makes the role of estimator an important one for the roofing companies. Looking for a trusted pest control company to help protect your family and home from unwanted pests? Look no further! When ants, termites, cockroaches, fleas, bedbugs or spiders have invaded your home making you feel uncomfortable, the best plan of action is to immediately get a professional pest control team to eradicate the problem and restore your peace of mind. We have successfully protected local homes in Australia for many years with our extensive pest control experience and expertise, backed by a comprehensive warranty. Cal a local pest expert today for a free quote! We have the solutions to detect, remove and deter all pests from home and office environments. Our professional service technicians are highly trained and certified and continuously undergo specific training courses in the latest state-of-the-art technical aspects demanded by the high standards in the pest control industry. From the start our sales experts will take control of your pest problems, ensuring that they are speedily and effectively dealt with so that you have nothing further to worry about. We support our highly skilled specialist pest control staff with the appropriate equipment, technology, and training required to deal with any pest control problem, making us one of the leading pest control companies in the country. Rats and Mice – these rodents are active throughout the year and nest in warm, quiet areas like basements, lofts or even in cavity walls. They are known to spread disease as they are constantly chewing through packaging to gain access to food, leaving their droppings behind. This could pose a serious health risk in areas where food is stored and prepared or where small children play. Finding evidence of rats or mice in your home can be very distressing. However, there are simple measures that will render your property mouse and rat-free. Cockroaches – these insects like to live in warm areas under floors and wall cavities and come out at night to feed on bits of food. They have known carriers of serious diseases such as Dysentery and Salmonella. 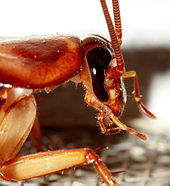 Exposure to cockroach droppings can cause gastroenteritis and increase symptoms of asthma and eczema. These extremely tough creatures have the ability to breed very rapidly, making it essential to use professional treatments powerful enough to eradicate and control all stages of the lifecycle. Ants – Ants prefer sunny climates and are most often found outside on lawns and paving, but will enter homes in search of food and water. They travel in a wide range following established trails and tend to cluster around food sources, making a nuisance of themselves. They can be controlled by sealing off entry points, keeping food surfaces meticulously clean and clearing away any food sources that may attract them. However, they are capable of causing damage to property, and a serious infestation should be dealt with by a skilled pest control team. Termites – termites are a more serious problem as they live on wood pulp, destroying wooden furniture and apertures as they march throughout a home. These pests need to be removed professionally before they inflict major damage to your property. Early detection can save substantial repair costs and safeguard the value of your home. Our termite inspectors should be consulted before purchasing a home. Inspection reports will outline existing infestations and damage as well as highlight areas of concern that could be vulnerable to future infestations such as open entry points in the foundations, lower levels of a home, or significant moisture deposits. Our professional pest control treatments can determine areas of termite infestation as well as expose those that pose a threat to future infestation. Bed Bugs – these blood sucking vermin live in soft furnishings like beds and sofas as well as dark cracks and crevices and come out after dark to feed on humans. They spread very quickly and are extremely difficult to eliminate, and professional services are recommended to control them. Spiders – Spiders are mainly harmless and not pests as they feed on flies and insects such as mosquitoes. However, they are often feared which could lead to panic attacks. There are more than 35,000 species worldwide, and only a very few can cause distressing symptoms from their venom when bitten. Professional spider removal is not only essential for people with an authentic fear of spiders but also to avoid a repeat infestation. If your family cannot bear the presence of spiders, our treatments will completely remove an infestation and effectively control re-infestation. Other pests like flies, wasps, and birds that become a nuisance can also be removed and controlled to make your living environment safe and comfortable. Give us a call today and chat to one of our experts about your particular pest problem. A carpet cleaning company should be able to use organic cleaning chemicals if need be. You don’t want them to waste time using things that are going to make you unable to enjoy being at home. Do you get headaches when companies are done the cleaning? Before you think that it’s because of dust being kicked up or anything, you may want to ask them to try something else to clean with that is natural. That may be all it is, and there are more than enough ways for you to find a cleaning solution in your case that works for you. Carpets are all different, so you can’t just clean them all the way you want to. A company is going to have to change how they operate depending on what materials your flooring is made of. For example, if you have a rare rug then you need to let the company know that it is and that they need to be gentle with it. Find a specialist that only works with your type of flooring when it’s something that could cost you a lot of money if they are not able to clean it in the right way with the right tools. Carpets are a good thing to take care of after you clean them. You should speak with the company about what they are going to do for you and what you need to do to make sure the work lasts. There are many great tools and things you can use to keep your floor looking great. Before you try to work on a stain, you should find out how to work with it with your particular flooring type in mind. That will let you know whether or not this is going to be something you can handle or if you should try hiring someone. A good service needs to come out regularly and give you a good deal because you stick with them. The first few times you work with someone can be seen as a test. Then you need to call their offices up and see what kind of deal you can get on them coming out at least once a month if you pay for multiple visits up front. If you go this route, make sure the company has been around for a while and that you get documentation of the fact that you paid for so many visits. A good carpet cleaning company is going to be easy to do business with once you find the best one for your needs. They need to be capable of doing a great job. It should also be cheap enough for it to be worth it. Custom built-in wardrobes are not only attractive to look at but can also add incredibly functional storage space to your bedroom, helping you stay organised so that it is easy to find everything that you need. Traditionally, wardrobes have been freestanding units that are similar to large armoires. However, there has recently been a trend to create built-in units that are more like custom cabinetry attached to the wall of the bedroom. There are quite a few differences between a traditional closet and a wardrobe. Closets tend to be far more open with fewer organisational structures inside. For instance, a closet may have a couple of shelves and a bar where you can hang your clothing. A wardrobe, on the other hand, may have separate areas for shoes, jewellery and accessories, folded clothing, hanging clothing, and any other items that you may wear on your body. Designing a custom built-in wardrobes starts by thinking about the types of items that you need to store. Make a list of all of the items that you want to fit into your wardrobe. Having a full inventory of all of your clothing, shoes, and accessories can help ensure that everything has a place in your new wardrobe. Next, spend some time looking at pictures of wardrobes online to get ideas for how to organise your new space. Often, the wardrobe itself is built similar to a large, open cabinet system with tall doors. Inside, wire shelving, pull-out drawers, closet rods, and other elements are installed to break up the space to make it more functional. Alternatively, shelving and drawers can be built directly into the unit. It is easier and less expensive to go with wire shelving and drawers. However, the choice is yours regarding what look you prefer. Again, this is an area where looking at photos can help. Based on the photos that you see you can decide which style of wardrobe you like the best and which seems the most functional for your needs. Finally, you need to decide whether you are going to build your wardrobe yourself or hire someone to do it for you. This largely depends on your skill and experience using power tools. Typically, building a wardrobe is not overly complex. However, if you don’t have the right tools or don’t feel confident in your abilities, you can certainly hire someone to take on the project for you. Custom built-in wardrobes can provide beautiful, functional storage for all of your belongings. Best of all, they can also help increase the resale value of your home. If you are looking for a way to stay organised, a well-designed wardrobe can provide a place for everything so that you always know exactly where to look for a particular item. This can make it faster to get ready for work in the morning since you don’t have to spend a lot of time hunting for the item that you need.